Donation Target Made, new Intel Mac Purchased. 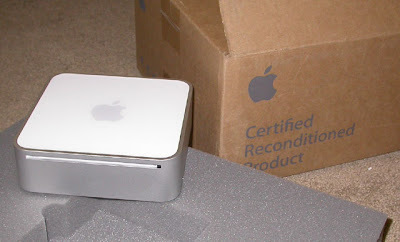 Here's the Mac mini that Love bought. Anyway, we met the goal and I purchased a new Intel Mac mini (refurbished) from the Apple Store. I'll be installing the developer tools, moving my Fetch Art development files over and starting on development of an Intel compatible version of Fetch Art ASAP. Thanks again for your generous donations. I put in a little over $130 of my own money too to get a slightly upgraded Mac mini. If you wish to donate, additional funds I receive will go to upgrading the RAM and CPU. I've unpacked the new computer (as the picture shows) and am currently running software update to get the latest updates from Apple. My primary server is being moved (for more storage and bandwidth). However, that means www.aric.org will be offline. I see GoDaddy has put up a generic "parked" page temporarily. Anyway, have no fear that once the DNS and server settings are all completed, Fetch Art will be available for download again, and I'll be releasing more news about updates! UPDATE: 4/23/2007 aric.org and Fetch Art have been moved to my new servers and are back online.